For a 10-12 year old, this might be a really nice glove. How old is your kid? If your kid has a small hand, you may want to consider the Rawlings GG1150 or GG1000 made for small hands and wait to spend the money on the next one. 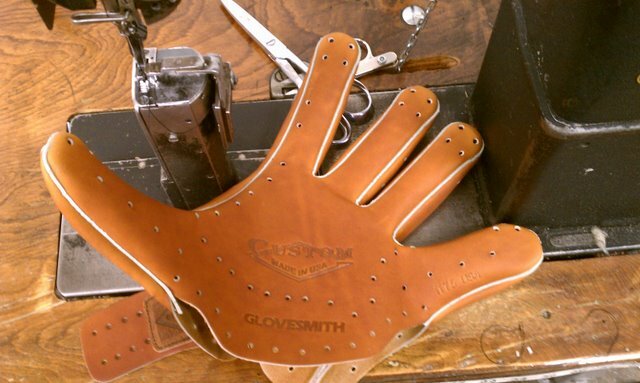 Here are some gloves to consider, the Rawlings would be the toughest to break in, the Vincis and Nokona not so bad. Or, at ballglovewarehouse.com, the Nokona Buffalo Combo Series: AMG1200BCCW (also plays small 11.5" - 11.75", but with a large pocket that would work for softball). The buffalo combo gloves are the lightest weight gloves Nokona makes. Also. the Nokona AMG175 comes in a fastpitch model (Velcro back and tighter finger stalls) but measures in at 12.25". The Buckaroo model will be the lightest. Or, at ballgloves.com, the Rawlings PRO1000-12P (but I think it might actually be 12.25"). It also has a wide and deep pocket that would work for softball. It may well be too big. I think the Mizuno GMVP gloves are one of the best gloves for the $$$, normally around $100 retail, but they are on the heavy side. The leather is thick, but not overly stiff. Anyone looking at one of these on ebay should know the size is in the model # - a GMVP1256 is a 12.5" glove, as is a GMVP1258. It seems a lot of the GMVP1256s are mis-stamped as 11 1/2". My daughter's glove is stamped wrong, and I've seen at least 2 or 3 others that are stamped wrong and therefore listed or described wrong. This goes for both right and left handed gloves.